Do you have an account with Indian Overseas Bank? Indian Overseas Bank is a nationalized bank with several numbers of branches across the country. The bank upgrades its banking services to deliver advanced facilities to its customers. The account holders need to check the available balance in their account for different purposes. It is also the responsibility of the account holders to remain updated with the available balance in the account. How do you check the available balance in your account? Of course! The banks provide different options to check the account balance. The options include passbook printing, accessing online banking services and using ATM/Debit card. The traditional methods of checking the account balance are time-consuming, require effort and have certain restrictions. 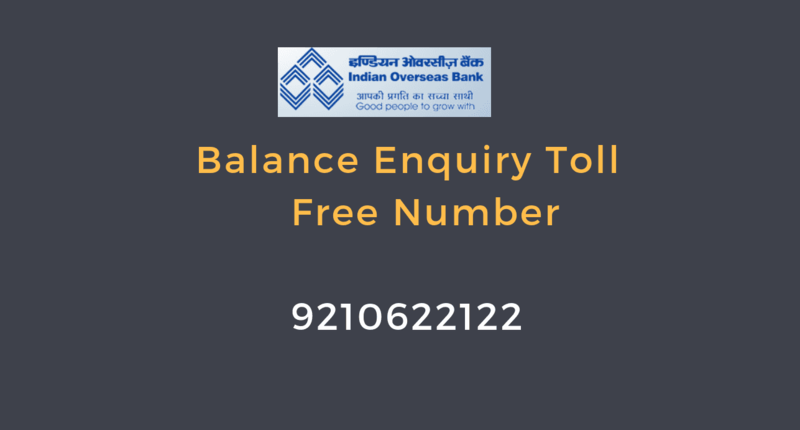 Indian Overseas Bank introduced a balance enquiry toll-free number for the customers to obtain the available balance in the account by giving a missed call. Missed call service is the easiest method to get balance information quickly. Dial balance enquiry number 9210622122 from your mobile. Make sure to dial the number from your registered mobile number linked with the account. Disconnect the call after 2-3 rings or the call will get disconnected automatically. Wait for a few minutes to receive SMS from the bank. Open the SMS to find the updated info about the available balance in the account. It is the easiest and fastest method to check account balance. You can access the missed call services anytime and from anywhere. The bank or the network service provider will not charge you the call rates as it is a toll-free number. Any customer with a registered mobile number can access the missed call services. Mobile number should be linked with the saving account. If you have not linked mobile number to your account yet, then submit an application to update mobile number.